Scrap fully represented TMT's commitment to theatre in education which had developed over preceding years. Workshops had been held regularly in locations as diverse as Brighton University and the Montague House Day Centre. 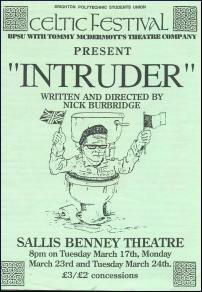 A memorable Christmas show performed entirely by clients, Witch Panto?, resulted from the latter, while work with Performing Arts students, particularly on aspects of Shakespearean comedy, led almost inadvertently to Intruder, a play produced as part of a Celtic festival with a student cast. TMT's theatre in education has formed the major part of its recent activities, providing music and assistant direction for productions at Haywards Heath College including The Taming of the Shrew, David Farr's The Nativity and Brendan Behan's The Hostage (which involved a unique workshop with his brother Brian). While the strong association with Aine King and Lip Service Youth Theatre has resulted in musical direction for her productions of Edward Bond's Tin Can People and Euripides' Trojan Women.